Former Vice President Joe Biden speaks at the Biden Courage Awards, an event related to combating campus sexual assault, on Tuesday. Activist and former candidate Lucy Flores says Biden touched her in 2014, in an encounter that "wasn't violent or sexual, it was demeaning and disrespectful." A former Nevada Democratic assemblywoman and candidate for lieutenant governor has come forward detailing an unwanted encounter with Vice President Joe Biden when he campaigned for her in 2014. Lucy Flores writes in New York magazine about her "awkward" experience with Biden, saying he grabbed her shoulders from behind, sniffed her hair and then planted a kiss on the back of her head before a campaign event. On Friday, a spokesman for Biden said that the former vice president and staff who were present do not "recall what she describes." "I'm not suggesting that Biden broke any laws," Flores writes, "but the transgressions that society deems minor (or doesn't even see as transgressions) often feel considerable to the person on the receiving end. That imbalance of power and attention is the whole point — and the whole problem." 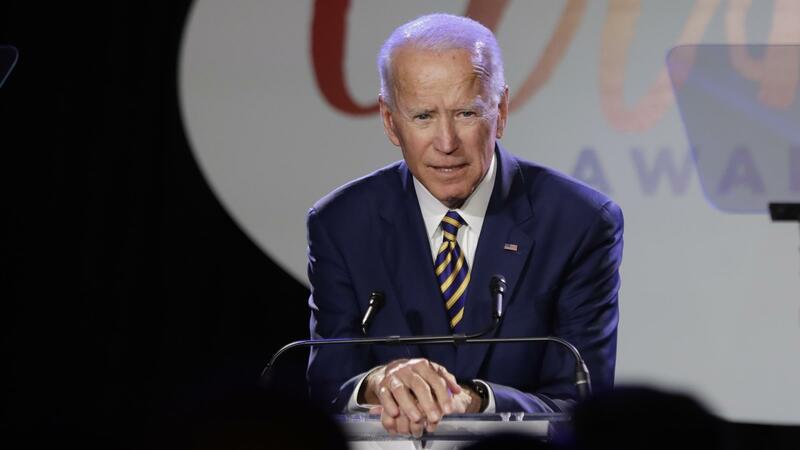 The accusation from Flores brings a troubling issue back into the spotlight for Biden right as he is widely expected to launch a 2020 White House bid. Throughout his political career, the former vice president and Delaware senator has frequently been photographed engaging in close physical contact with women, appearing to touch or even kiss them without their consent at public events — from Obama Defense Secretary Ash Carter's wife Stephanie to Iowa Republican Sen. Chuck Grassley's wife Barbara. Many of those instances at the time were dismissed as simply "Joe being Joe," given the friendly persona he gives off. But in the #MeToo era, encounters such as the one Flores newly describes, face new scrutiny. I felt him get closer to me from behind. He leaned further in and inhaled my hair. I was mortified. I thought to myself, "I didn't wash my hair today and the vice-president of the United States is smelling it....Why is the vice-president of the United States smelling my hair?" He proceeded to plant a big slow kiss on the back of my head. My brain couldn't process what was happening. I was embarrassed. I was shocked. I was confused. There is a Spanish saying, "tragame tierra," it means, "earth, swallow me whole." I couldn't move and I couldn't say anything. I wanted nothing more than to get Biden away from me. My name was called and I was never happier to get on stage in front of an audience. Flores wrote that the episode "made me feel uneasy, gross, and confused. The vice-president of the United States of America had just touched me in an intimate way reserved for close friends, family, or romantic partners — and I felt powerless to do anything about it." She writes that "his behavior wasn't violent or sexual, it was demeaning and disrespectful" and he wasn't "treating me like a peer" or "the most qualified person for the job" at that moment. Flores says she told her staff but didn't plan on telling others — until "[t]ime passed and pictures started to surface of Vice-President Biden getting uncomfortably close with women and young girls," and she could no longer "give Biden the benefit of the doubt." But she writes that dismissing this as simply Biden being like a somewhat "creepy uncle," "shows a lack of empathy for the women and young girls whose space he is invading, and ignores the power imbalance that exists between Biden and the women he chooses to get cozy with." Flores says she remained quiet for years, "fear[ing] my experience would be dismissed... But hearing Biden's potential candidacy for president discussed without much talk about his troubling past as it relates to women became too much to keep bottled up any longer." During her 2016 Democratic primary campaign for Congress, Flores was endorsed by Vermont Sen. Bernie Sanders, who is again seeking the Democratic nomination for president. Flores writes that she "spoke to a male friend who is also a political operative in Biden's orbit," and that he made her question her actions and recollection of the event, and reminded her about Biden's "significant resources," suggesting that her credibility would be attacked if she came forward. Biden spokesman Bill Russo said in a statement that the former vice president "was pleased" to support Flores and hold the event for her. "Neither then, nor in the years since, did he or the staff with him at the time have an inkling that Ms. Flores had been at any time uncomfortable, nor do they recall what she describes," Russo said. "But Vice President Biden believes that Ms. Flores has every right to share her own recollection and reflections, and that it is a change for better in our society that she has the opportunity to do so," Russo continued. "He respects Ms. Flores as a strong and independent voice in our politics and wishes her only the best." Just this week, Biden spoke at the "Biden Courage Awards," an event for It's On Us, an organization started under the Obama White House to combat campus sexual assault.